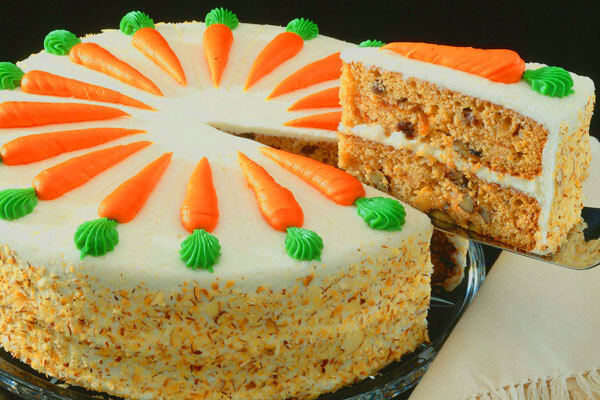 Easter is a great time to serve carrot cake as you can decorate the cake with icing carrots making a great Easter treat, but of course this recipe can be used anytime of the year. In a mixing bowl, mix sugar, vegetable oil, and eggs. In another bowl, sift together flour, baking soda, salt, and cinnamon. Fold dry ingredients into wet mixture and blend well. Fold in carrots and chopped nuts until well blended. Distribute batter evenly into 3 (9-inch) cake layer pans, which have been generously greased. There will be approximately 1 pound 5 ounces of batter per pan. Place in preheated oven and bake for 50 to 60 minutes. Cool layers in pans, for approximately 1 hour. Store layers in pans, inverted, in closed cupboard to prevent drying. Layers must be a minimum of 1 day old. To remove layers from baking pan, turn upside down, tap edge of pan on a hard surface. Center a 9-inch cake circle on top of revolving cake stand. Remove paper from bottom of layer cake. Place first layer, bottom side down, at center of cake stand. With a spatula, evenly spread approximately 3 1/2 ounces of frosting on the layer. Center second layer on top of first layer with topside down. Again with a spatula, evenly spread approximately 3 1/2 ounces of frosting on the layer. Center third layer on top of second layer with topside down. Using both hands, press firmly but gently, all layers together to get one firm cake. With spatula, spread remainder of frosting to cover top and sides of cake. Refrigerated until needed. Display on counter or cake stand with a plastic cover. In a suitable bowl of large mixer, place powdered sugar, cream cheese, vanilla, and margarine. Beat at second speed until thoroughly blended. Hold refrigerated and use as needed.